Definition at line 96 of file counters.h. Definition at line 98 of file counters.h. 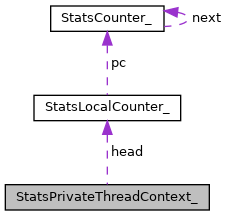 Referenced by StatsAddUI64(), StatsGetLocalCounterValue(), StatsIncr(), StatsReleaseCounters(), StatsSetUI64(), StatsThreadCleanup(), and StatsUpdateCounterArray(). Definition at line 103 of file counters.h. Referenced by StatsAddUI64(), StatsIncr(), StatsReleaseCounters(), and StatsSetUI64(). Definition at line 101 of file counters.h.